Okay, turn on the monitor… put the headphones on… check email… let’s get to work! (work work work work) Oh let’s listen to some tunes. Why can’t I hear anything? I do this all the time. Even funnier when I have a song in my head, and I go to turn up the volume for one of the good parts. Headphones aren’t the only things I’ve started the process with, and somehow end up not finishing, and just walk about with untied shoes, for instance. Just one of those times your brain just leaves without you, and you realize you almost answered the door with your zipper down. Oh god… I saw the thumbnail for this picture. Our protagonist looked like some kind of hideous frog man. ‘Mickey-Mouse Ears’ ear protection, can be quite useful OFF the flight line; blessed silence! 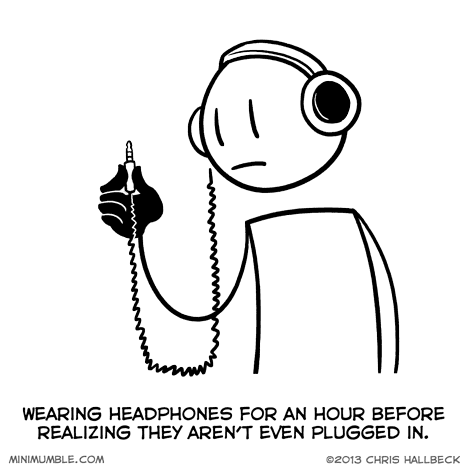 I get a similar problem: fiddling with the headphones for 5 minutes before realizing the volume is all the way down. I did this during a test at school once.